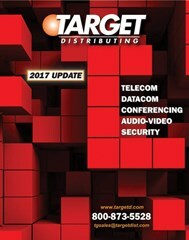 Here at Target, we keep you abreast of all of the exciting changes in technology in the fields of Telephony, Datacom, Conferencing, Audio/Video and Security Products by constantly scouring the marketplace for the latest trends, newest products and best values available! This catalog includes only the “adds, moves and changes” that have taken place since our full 224-page catalog was released earlier this year, and represents just a small portion of the over 125 lines and thousands of items that we distribute. If you need additional copies for your staff call us at 800-873-5528 or click here to order. and we’ll get them on their way immediately.